Online poker can be a difficult beast because you cannot get tells or observe opponents' behavior patterns like you could in a brick-and-mortar cardroom, but Holdem Manager 2 (HEM2) can help you out. 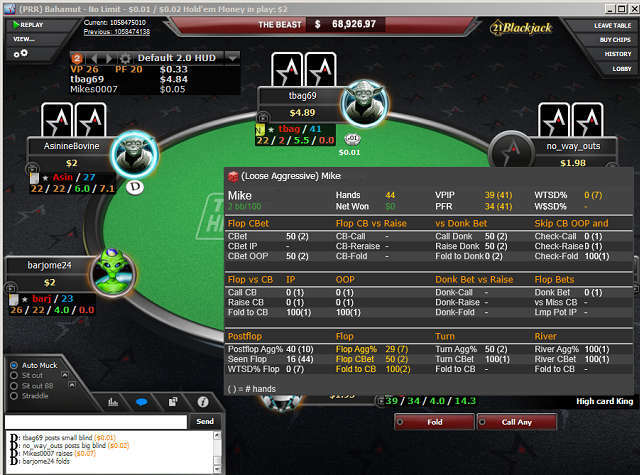 This heads up display and tracking tool lets you get a handle on your competitors' tendencies and playing styles while grinding poker tables over the internet. It even records all your play so that you can keep detailed information on your monetary results (very useful when tax time rolls around) and gain insight into possible leaks in your own game. Some people balk at paying for HEM2, but really, the investment should pay for itself many times over. For higher-stakes players, it represents less than a buyin. Even for micro-stakes poker fans, the cost of the software should be more than recouped within a few months in the form of an increased winrate. Actually, there's a special, lower-priced version that allows you to import hands from $50nl and below, $0.50/$1.00 LHE and below, and tournaments with buyins of $22 or less. If you're an Omaha player, then there's a separate download for you although you may wish to spring for the combination Hold'em + Omaha package. When you open up Holdem Manager 2, you'll see a number of menu items at the top. Perhaps the one in which you'll spend the most time is “Report.” This shows you a breakdown of your results and stats, and you can choose to view them by stakes, session, position at the table, and several other criteria. Powerful filters permit you to only include hands played within a certain date range or in which you took a certain action, like raising preflop. You can choose which stats you'd like to include in each report, and you can group them together in custom ways to create your own bespoke reports. The bottom half of the display shows a list of the most recent hands you've played along with a summary of the betting action in each of them. You can sort and filter these hands to find the specific ones you wish to review. Then you can read the hand histories and even replay them in a graphical interface. There are various optional add-ons for Holdem Manager 2, like LeakBuster, which analyzes your database to uncover leaks in your game, TableNinja 2, a multi-tabling assistant, and SnowieApp, a heads-up artificial intelligence GTO training app. The HUD, or heads up display, is the mechanism through which HEM2 gives you real-time data on your opponents. When you launch Holdem Manager, it will automatically import your hand histories from the sites you've previously configured in the settings. When you start playing, after a delay of a hand or two, it will realize that you have active tables and will overlay a wealth of information atop these tables. Each opponent will have his or her own HUD panel displaying a few stats that describe how that person tends to play. You can hover your mouse over any of the numbers to bring up additional data. There are a number of preconfigured HUD arrangements that you can select from. Furthermore, it's possible to edit the HUD so that it's laid out just the way you want it. You can remove stats that you find useless, add additional metrics, change the font, and even specify different colors that you want to apply to the numbers depending on ranges that they fall within. This is only a short list of some of the most popular internet poker sites that work with Holdem Manager 2, but there are plenty more. Step 1: Clear your browser cookies. Click on the appropriate browser icon if you need instructions. Step 2: Please click on this signup link for Holdem Manager 2, which will bring you right to the Holdem Manager website where you can acquire HEM2 at the best price possible. Holdem Manager's first incarnation was released in January 2008 after more than half a year of private and public betas. It immediately captured significant market share from its main preexisting rival, PokerTracker 2. One of the most notable features was the ability to handle databases with millions of hands without terrible slowdowns. Even after PokerTracker 3 arrived later the same year, many felt that Holdem Manager was the superior product. Development continued on the initial program with many updates released, but the groundwork for its successor, Holdem Manager 2, started up pretty soon. This new version of the HEM suite hit the virtual shelves in November 2011, boasting new reports, powerful filters, and an array of opponent analysis functions. Meanwhile, rival PokerTracker 4 appeared at about the same time. Both companies merged in August 2014, but both products still remain available for separate purchase. Holdem Manager 2 is currently being offered for sale although Holdem Manager 3 is in beta testing. Don't worry; if you buy HEM2 today, you'll be able to upgrade to HEM3 free of charge when it becomes available! There's another poker tracking solution produced by the same firm as Holdem Manager, and you can read all about it in our PokerTracker 4 review. 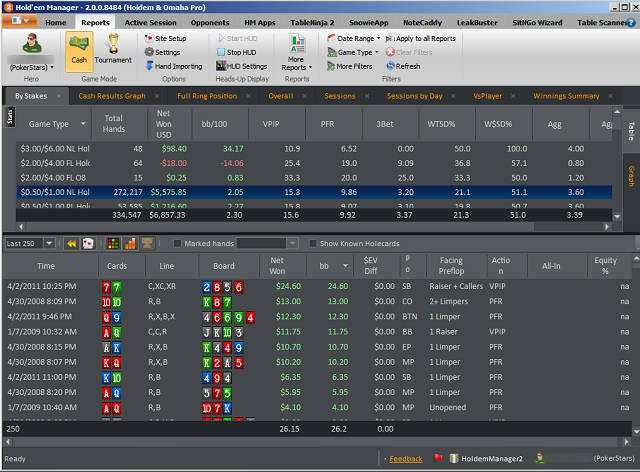 If you'd like to explore other top poker software options, then check out our page devoted to the best poker software on the market.